﻿ Kaliento - eSport equipment - Why do gamers use hand warmers ? To face the cold hands’ effect while gaming, you might have noticed a new esport equipment the hands of your favorite “League of Legends” or “Counter Strike” teams. Then you might have wondered why do pro gamers use hand warmers that are usually associated with mountain sports or fishing. If you’ve ever watched a professional gaming competition or eSports event you might have noticed some of the players squeezing and playing with small rectangular objects that look a bit like oversized tea bags. What they’re actually doing is using hand warmers, but what does summiting Kilimanjaro have to do with eSports? The total earnings from eSport competition in 2016 was higher than 94 millions $. When you are playing against the best team in the world and you want to bring it home, there is no room for the unexpected. A player’s hands are crucial during competitive games, top players need to execute moves quickly and precisely. This new esport equipment would respond to this need. Why do gamers use hand warmers? Cold hand temperatures slow the nerve signals from brain to hand but also cause stiffness and clumsiness, which is the opposite of what a gamer needs. No one wants to miss a shoot or fail an important move because he’s got cold hands on main stage during final round. During competitive games, your performance is based solely on the speed of your fingers on the keyboard or a mouse button. Let us give a scientific explanation to this facts. Who has never lost a game because of cold hands? It’s frustrating! Everyone has been annoyed with their mouse or complaining on Teamspeak at least once because they’ve experienced a numbness in their fingers. Reaction time is the amount of time it takes to identify a signal and produce a response. In other words, the reaction time is your click speed when an enemy appears on the screen. Today there are over 226 studies showing converging evidence that cold has a deteriorating effect on psychomotor performance. Let’s take one of these studies as an example. Scientists chose a sample of 30 people aged 18 to 22 in order to measure the reaction time needed to respond to a stimulus. Scientists asked them to click as fast as they possibly could when the visual stimulus appears on the screen. They recorded the times of the participants on a datasheet and then they request them to submerge their hands in a bucket of cold water. After a few seconds, they asked them to repeat the test. The evidence shows that reaction time increases as the local temperature decreases, and that cold temperature slow the reaction speed. eSport is ruthless and the winner is the one who reacts the fastest. No one wants to fail an important move because they didn’t react quickly enough.Speed and integrity of information processing are affected by the degree of thermal discomfort that is experienced, which is mainly mediated by the level of skin temperature. The results of the present study indicate that temperature is one of the most influential factors to reaction time. 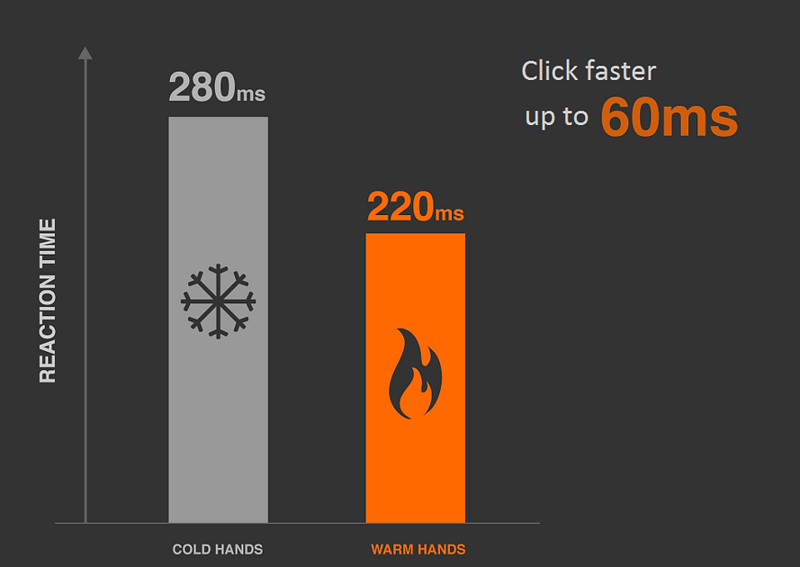 A gamer with warm hands can react 21% faster than one who has cold hands. This entry was posted in News and tagged Cold hands, Kaliento, Tips & training.